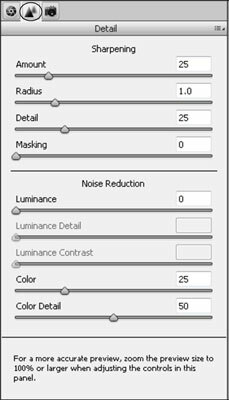 The Camera Raw window in Photoshop Elements 11 has a large number of settings, as the following list describes. Familiarize yourself with these settings in order to make the most of your images. Zoom: This tool zooms in and out of the Image preview. 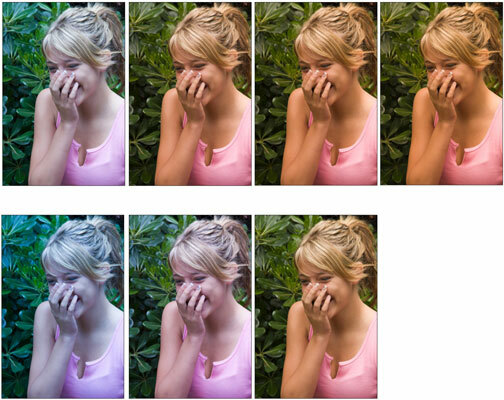 Hand: This option moves the image around, just as it does in the Elements Image window. Eyedropper: This samples color in the image. Crop tool: Draw a marquee with the Crop tool and make your color and brightness adjustments. The adjustments are applied only to the area defined by the Crop tool. When you click Open Image, the photo opens, cropped to the area you marked with the Crop tool. Straighten tool: The Straighten tool enables you to draw a horizontal axis to straighten a crooked photo. Red Eye Removal: Click the Red Eye Removal tool to remove red-eye caused by flash lighting. Open Preferences dialog box (Ctrl+K [Command+K]): Click this tool to open the Camera Raw Preferences dialog box, where you can make choices for saving image settings, change default image settings, and use the Adobe Digital Negative (DNG) format. Rotate Left: Used to rotate the image counterclockwise. Rotate Right: The last tool below the Title bar is used to rotate the image clockwise. Preview: Select the check box to show dynamic previews of your edits. Shadow/Highlight Clipping: The Shadow and Highlight buttons above the histogram (denoted by the up-pointing arrows shown above the histogram at the top of the adjustments pane) show clipping in the shadows (dark areas of the image) and highlights (light areas of the image). Clipping means that, in a certain area, the image has lost data (and, ultimately, detail), and you don’t want clipping to appear in your pictures. 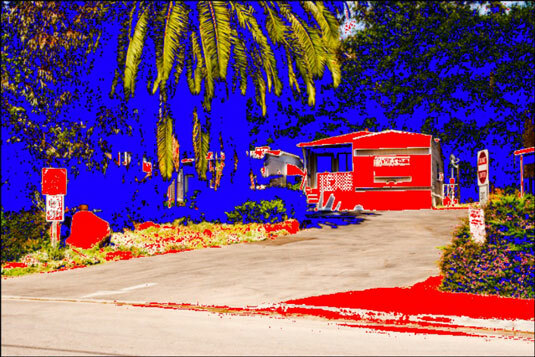 When you make adjustments with these two check boxes selected, shadow clipping is shown in blue, and highlight clipping is shown in red in the Image preview. Histogram: This graph displays all three channels (red, green, and blue) in an image simultaneously. The histogram changes when you change other options in the Camera Raw window. The histogram graphs how pixels in an image are distributed. The distribution includes the number of pixels at each color-intensity level (one of the 256 levels). If images have pixels concentrated in the shadows, you see the histogram skewed to the left. Conversely, images with pixels concentrated in the highlights reveal a histogram skewed to the right. As you grow more familiar with histograms, eventually a quick glance at a histogram will suggest adjustments to make to improve an image. RGB values: These values appear below the histogram. When you first open an image, you don’t see any values in the RGB area. Click the Zoom tool, the Hand tool, or the Eyedropper tool and move the cursor over the Image preview. When you move any of these tools around the image, the RGB values corresponding to the point below the cursor are reported in this area. Detail icons: The three icons change the pane below the Histogram from Basic to Detail, where you apply sharpening and noise reduction, or to Camera Calibration, where you can select a camera profile. Settings (pop-up menu): This pop-up menu opens when you click the small icon on the far right of the Basic tab. From this menu, you have choices for applying settings to the open image. If you change any setting, the menu option changes to Custom. White Balance: You use White Balance settings (available on the Basic tab — the leftmost icon below the histogram) to adjust the color balance of an image to reflect the lighting conditions under which the shot was originally taken. Remember that the sensor in a digital camera is capable of capturing the entire range of white balance that the sensor can see. You choose your settings not necessarily on the basis of what you see, but rather to match the white balance of the shot you took. Therefore, if you set up your camera to take pictures under one set of lighting conditions and then move to another set of lighting conditions but forget to change the settings, you can let the Camera Raw plug-in correct for the difference in white balance; that’s because the sensor picked up the entire range, and the necessary data is contained in the file. here, you can see a picture taken with the camera set for tungsten lighting, but the shot was taken outdoors in daylight. By changing the White Balance setting in the Camera Raw dialog box, you can see how different settings affect the image color. Temperature: If one of the preset White Balance options doesn’t quite do the job, move the Basic tab’s Temperature slider or edit the text box to settle on values between one white balance choice and another. Use this item to fine-tune the white balance. Tint: Tint is another fine-tuning adjustment affected by white balance. This slider and text box (again, found on the Basic tab) are used to correct any green or magenta tints in a photo. Brightness adjustments: Several adjustment sliders and text boxes in the Basic pane help you control the image brightness and tonal range. Notice the Exposure setting. This item lets you correct photos taken at the wrong exposure. Cancel/Reset: When you open the Camera Raw window, the button you see by default is Cancel. Press the Alt (Option on a Mac) key, and the button changes to Reset. If you want to scrub all the settings you made and start over, press the Alt (Option) key and click Reset. Open Image: This button is the default. Click Open after you choose all your settings to process the photo and open it in Elements. Open Copy: Press the Alt (Option) key, and the button changes to Open Copy. Click Open Copy to open a copy of the raw image in Elements. Done: Clicking Done doesn’t open the image in Photo Editor. You click Done after changing the settings; the new settings then become the new defaults for your raw image. You can clear the defaults by opening the flyout menu (top-right corner) and selecting Reset Camera Raw Defaults. Zoom: In this drop-down list (located in the bottom-left area of the Raw Camera plug-in window), you can choose from several zoom presets. You can also edit the text box, click the minus (–) button to zoom out, or click the plus (+) button to zoom in. Using any option from the menu zooms the Image preview. Help: Clicking the Help button opens a Help document to assist you in understanding more about Camera Raw. Save Image: Click the Save Image button to open the Save Options dialog box, where you can rename the image to save a copy and make choices for saving in the Adobe Digital Negative (DNG) format. Depth: If your camera is capable of shooting higher bit depths, they’re listed here. If you want to convert to 8-bit images for printing, you can select the option from the drop-down list.